The quilt I’m working on has been very stubborn today, and I’m about to rip out a piece of sashing for the second time in the hopes that this time the squares will line up on either side. Needless to say, I’m not going to post about that today in any more detail: maybe Friday. Meanwhile, I’m on break from classes for the next several days, so yesterday I sat down, turned on the TV, found a movie I wanted to watch, and spun on my Ashford Traditional. It was really relaxing, and it was nice to sit down and just spin at my ‘default’ yarn without putting too much thought into it. 4 ounces of fiber came out to about 200 yards of 3-ply. 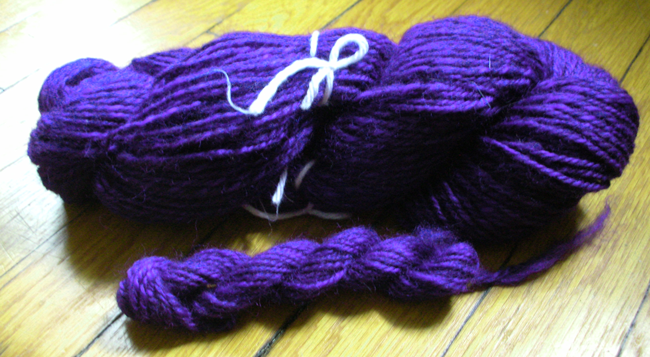 The fiber was a Ultraviolet BFL roving from Fiber Optic Yarns. I picked up several rovings from Fiber Optic Yarns when I was at Greencastle a little over a year ago. And while I really want to knit with them, the colors are just so gorgeous that I’d been having a hard time making myself spin them up. Thankfully, the My Precious Quilt-Along has reminded me that, really, working with the pretty materials can be a good thing! I’m really happy with this yarn: the color doesn’t come through clearly in the picture, because it’s been raining and awful all day, and the light is completely flat. Go look at the picture I linked to: there you can see how the purple dips into and out of an almost black hue. Previous Previous post: Knitting WiPs, or, sock roundup.